A quiz is a form of mind sport where your knowledge is assessed by the number of questions you answer correctly. 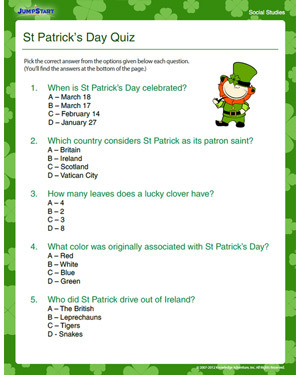 Quizzing can be fun and informative, so we decided to check how much you know about St Patrick’s Day - an important holiday celebrated all over the world in honor of Saint Patrick. This quiz comprises 10 questions that range from the really easy to the pretty tough. So watch out and make sure you know all there is to know about this important holiday!